This week our team have looked at the most used Social Network in the UK. We looked at the market share that the main Social Networks had and surprise surprise there were was some unexpected news. Working our way down the list the we start at the 7th most used Social Network. Now its time for the faceoff: Facebook VS Twitter and surprisingly the winner is way out in front. 2. Ranking in at Number 2 in the UK market share is Twitter. Twitter is at an all time high at the moment and we predict their market share will only grow more and more now businesses are using it to build relationships with clients and associates. Facebook's major rise came in the 4th quarter of 2009 where it rocketed from 31.37% to 77.81% in 2 months. 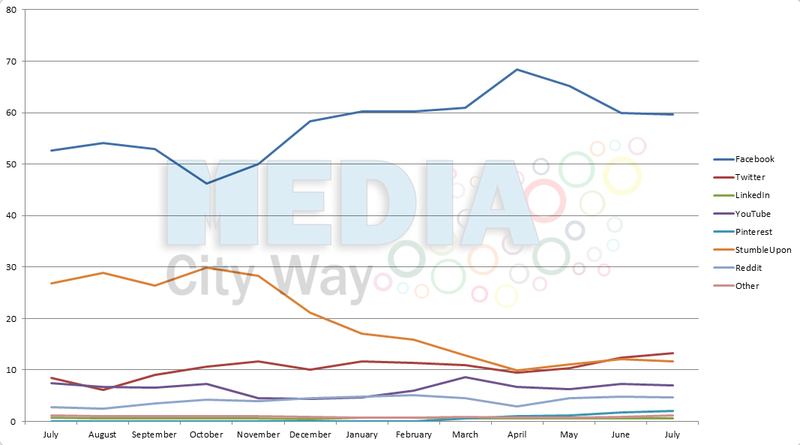 Percentage Stats of the past 12 months.